An Elegant Inspiration shoot at the Bindery in McMinnville. Hello, lovelies! I hope you’re all getting time to soak up this gorgeous October sun! While our weekends may not be as full with weddings this time of year. We’re still busy with fun projects and “behind the scenes” work to ensure we’re ready to shine the coming year. 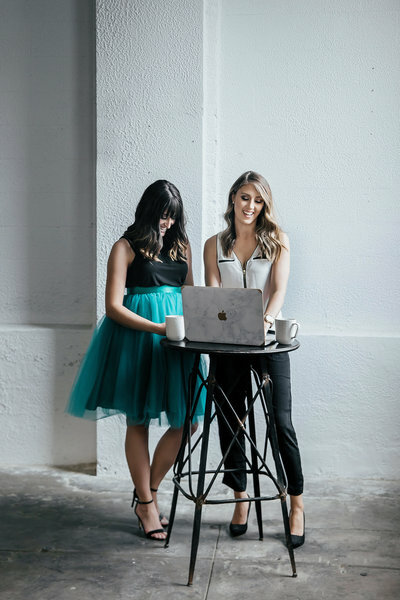 Today I’d like to share one of those lovely projects: an elegant inspiration collaboration with The Pigeon Letters and Lauryn Kay Photography. The shoot took place at a unique industrial event space in historic downtown McMinnville, Oregon called the bindery event space. Inspiration shoots are always a fun way to let the creative juices flow and flex our design muscles. We love brainstorming with other vendors to create something truly unique. Peggy of The Pigeon Letters came to us with the idea for this shoot: an elegant and soft look with striking green accents and modern touches. The Bindery in McMinnville provided the perfect backdrop for this look. With soft light pouring in through the endless windows and a subtle industrial feel, it let every element shine. This needed to be a beautiful marriage of romantic and edgy. 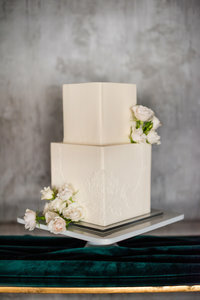 Dream Cakes brought in a gorgeous modern and green touch with a geometric cake. The marbling and sugar work on the cake beautifully mirrored the custom jewelry from Little Sycamore. Everything about this bridal look is romantic and elegant, yet uniquely untraditional. From the pale blue gown to the raw jewelry and bold lip, this look is striking yet soft. We hope this is inspiring for any brides looking beyond traditional white and diamonds. We knew we wanted the floral to be swoon-worthy and romantic but also subtly bold. Metal & Moss wowed us with her one-of-a-kind climbing installment that would provide a perfect backdrop for portraits or a ceremony. She included grasses and vines to create texture and structure in the bouquet and tablescapes. To accent the lush floral, we pulled in a natural linen runner, bold placeware, and antique candlesticks. The floral and candles create an asymmetrical tablescape which is unique and traditional all at once. Since invitations provide the first impression to your guests, The Pigeon Letters put love into every little detail. Her custom, hand painted, watercolor designs and bold gold accents bring life to the soft, handmade paper from Fabulous Fancy Pants. Of course, no celebration would be complete without champagne! The Bindery’s lounge was the perfect spot to pop open some bubbly and relax. Which is always the perfect ending to any day, right? We hope this shoot inspires brides with fresh ideas, encouraging you to be bold with your style and true to your vision!